An international bestseller delivering good news on brain function and ageing We all worry sometimes that our brains - particularly our memories - just don't work as well as they used to. In this illuminating book, internationally acclaimed Dutch neuroscientist Andre Aleman shows that although the decline in our mental capacities begins earlier than we think, this is not such a bad thing. In fact, older people are more resistant to the effects of stress, cope better with their emotions and with complex situations, and are - generally speaking - happier than their younger counterparts. Our Ageing Brain will change the way we think about age and mental acuity. 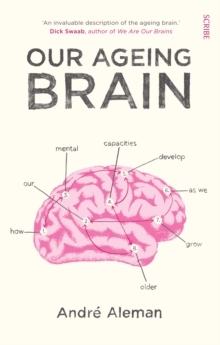 Drawn from the latest research in cognitive science, it outlines what takes place in the brain as we age, how to recognise the early symptoms of Alzheimer's disease, and how to distinguish fact from fiction when it comes to ways of slowing down the ageing process. It concludes with the seven most important things we can each do to keep our brains healthy. Published here in English for the first time, this is a refreshing, informative, and ultimately reassuring examination of what happens to our most important organ as we grow older.